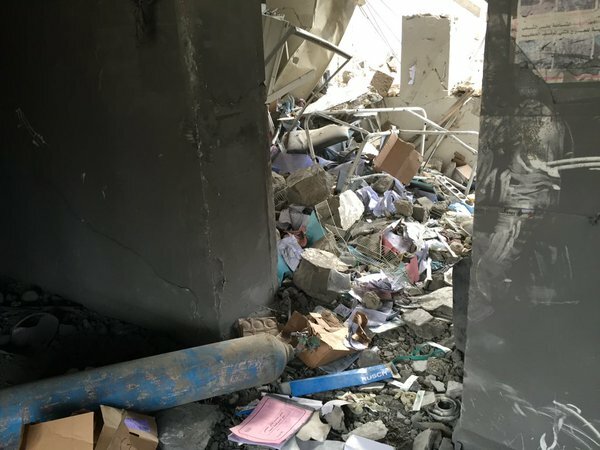 Retribution: Hospitals Bombed On Purpose By U.S. If there’s one lesson to be learned from the last 40 years of America’s behavior, it is that no deed is black enough, no morals are ever on display, and no quarter is given, not even to woman, children, doctors, or hospitals. Every time you think that you’ve seen it all, another heinous event pops up. The kidnappings, the renditions, the torture cells operated around the world, the torture prisons at Abu Ghraib, the Guantanamo disgrace, the use of “depleted” uranium in Iraq, the assassinations by drones of American citizens without a trial, the murder of thousands of others in the middle east on a weekly basis by merciless aerial bombardment against civilian populations, the list goes on. And now we have another set of incidents. 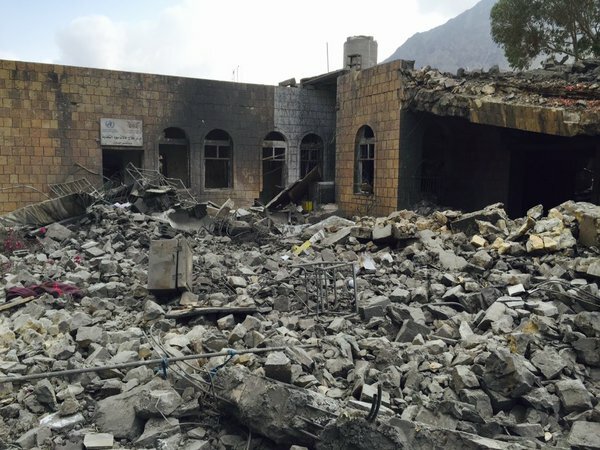 Blatant war crimes carried out by the Pentagon and its partner Saudi Arabia. At the present time there will be no investigation by Congress, the President, or any other U.S. Government authority into the hospital attacks, and the key question: “Who ordered these murderous attacks?” will not be answered by the authorities or the mainstream press. There’s plenty of evidence as to why the attacks were ordered. It is circumstantial, but so self-revealing that no other conclusion can even be considered. The “oops, we goofed” excuse doesn’t wash. The Pentagon knew exactly where both hospitals were located. They were both deliberately destroyed. Why? One word: Payback. For What? For the huge campaign that Doctors Without Borders (MSF) has waged against the Trans-Pacific Partnership trade deal. Before anyone scoffs at this suggestion, look at the stakes. If this trade deal goes through, the big pharmaceutical companies will reap billions of dollars over the next couple of decades, maybe hundreds of billions, because the treaty locks in the high priced drugs and extends patent protection for years. Say goodbye to a lot of generic drugs. Also say goodbye to a lot of soon to be dead people, even in the United States (drugs to fight AIDS comes immediately to mind). Doctors Without Borders has been aggressively fighting this trade deal, claiming that millions of folks who depend on the inexpensive generic drugs will be at risk, and that means a death sentence to many of them, and horrible suffering for the rest. Their campaign against the TPP was causing waves, threatening the passage of this horrendous deal. The poor people of the world, already racked by war, pestilence, and drought, fleeing by the hundreds of thousands by land and sea, seeking some place of refuge, these folks cannot pay the high prices that the drug companies want for their life saving pills. If the TPP deal goes through, they may die by the millions. And certainly, we Americans, may be among the casualties. Recent history teaches that when there’s billions of dollars to be made, the morals and the laws take a back seat to profit. War itself is immensely profitable, so much so that the Pentagon has ” lost track” of over 8 trillion dollars since 2001. The added benefit of the TPP, the possible population reduction that will result, would make Prince Phillip, The Club of Rome boys, and the depopulation fanatics in the Obama administration squeal with joy. So the hidden hand slips the co-ordinates of the hospital into the Pentagon’s attack database, and on October 3rd planes bombed the MSF hospital in Kunduz, Afghanistan for hours. Doctors, nurses, and patients alike were blown to bits. Then, even as howls went up around the world to this vicious atrocity, the Pentagon sent tanks in to crush the remaining parts of the building into rubble, just to make sure that the message got through. 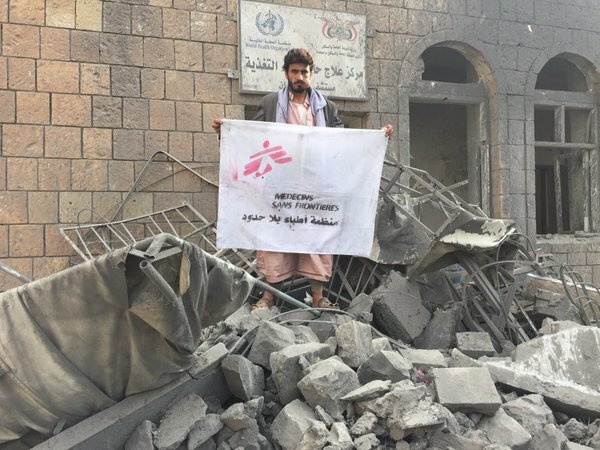 On October 26th, U.S. ally Saudi Arabia attacked another MSF hospital operating in Heedan, Yemen. Once again, the Saudis knew of the co-ordinates, they were following orders from Washington, who of course supplies them with the weaponry and training. As you can see from these pictures, they bombed the hospital into rubble. It’s at once bad enough to follow the events in the Middle East, the religious and political barbarism reaching new heights, with groups like ISIL thugs running mad dog campaigns of terror. They and others like them do it for their sick, twisted religious fanaticism. Here in the West, especially in Washington, where there’s no religion OR morals, it’s done for financial gain. The end result is nearly the same. Make way for the Four Horseman of the Apocalypse, for they are indeed now riding hard around the world, killing anything in their path.